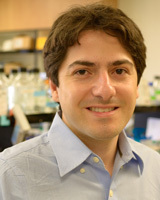 Dr. De Carvalho’s research focus is on understanding the epigenetic mechanisms underlying cell fate transitions, during normal differentiation, induced reprogramming and during tumorigenesis. Our ultimate goal is to translate this knowledge into more efficient approaches for epigenetic therapy. We use a truly multi-disciplinary approach to discover what mechanisms are driving these specific epigenetic alterations. To achieve this goal, we combine traditional molecular and cellular biology techniques with functional genomics screening, Next Generation Sequencing (NGS) and computational biology.